Most young children shy away from shots, but the thought of the needle can be less frightening if a child’s older sibling accompanies him and makes everything look super easy. 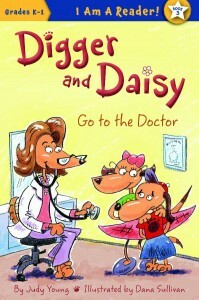 In Digger and Daisy Go to the Doctor by Judy Young, poor Digger has to drag himself out of bed. He doesn’t look or feel well, but when Daisy suggests that he needs to see a doctor, he panics. In his little doggy mind, doctors are equivalents to shots with needles. At first he is completely uncooperative. When the doctor asks to see his eyes, look in his ears, and see inside his mouth, he refuses and accuses her of planning to give him a shot. It takes his brave sister Daisy to persuade him by first demonstrating how easy it is to do as he’s asked. Like most youngsters, Digger mimics his big sister. Soon, the doctor has all the information she needs. Only things don’t go as planned. Somebody definitely needs a shot, but…it’s not Digger! 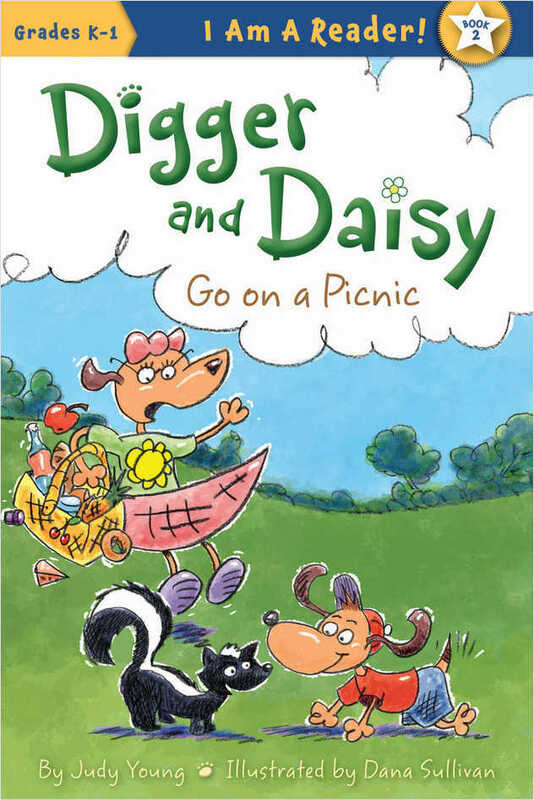 Digger and Daisy is an adorably realistic “I Am a Reader” book for grades K-1 that gives very young children an idea of why they may need to see a doctor, what a doctor’s office is like, and why getting a shot isn’t as bad as it seems. 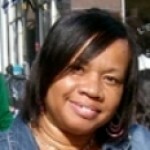 Ms. Young uses brevity to match her audience’s reading level, and repetition to build word recognition. Artist Dana Sullivan’s characters have big, round, kid-friendly faces and familiar scenarios that children see in everyday life to conjure smiles and even giggles. This book is great as part of a back-to-school package because young children often have to have shots before they can enter kindergarten or first grade. It is also great for starting discussions on how to express themselves when they’re not feeling well, and what it means when a child needs to go to the doctor. But beyond these things, it’s a great reminder of what it’s like to be a child, when even the smallest things seem big and all you need is your big brother or big sister to make your day sunny again.